Two teams settled their backup quarterback positions with one trade on Wednesday as the Green Bay Packers sent Brett Hundley to the Seattle Seahawks in exchange for a sixth-round pick, according to ESPN insider Adam Schefter. This locks in DeShone Kizer as the backup to Aaron Rodgers for the Packers, who also reportedly plan to keep Tim Boyle on the 53-man roster as their third-string quarterback. The trade likely means seventh-round pick Alex McGough and veteran journeyman Austin Davis will not make it through Seattle’s final cuts. 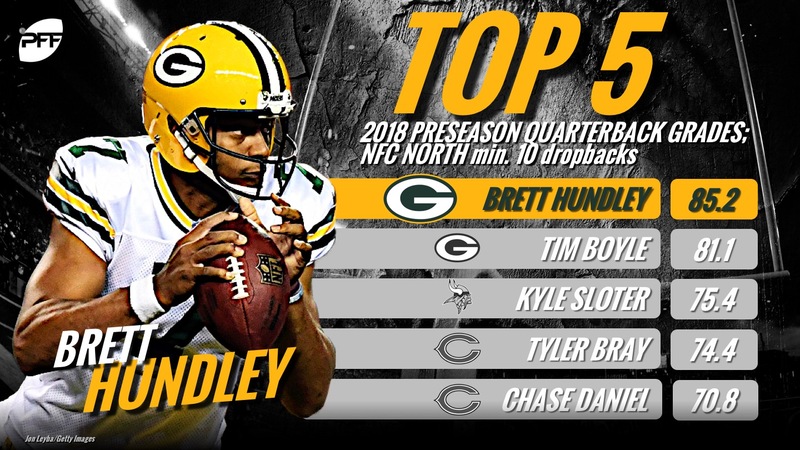 Hundley, a fifth-round pick back in 2015, is having his highest-graded preseason to date with an 85.2 overall mark that ranks sixth among all quarterbacks. He started nine games for the Packers last season after Rodgers was injured, and his 64.8 overall grade was 30th best at his position. He stood out from a clean pocket with an adjusted completion percentage of 80.3 while not under pressure, which ranked fourth among all quarterbacks, ahead of the likes of Rodgers and Tom Brady. Hundley’s issues came when the pocket collapsed. He had a passer rating of just 36.6 when under pressure in 2017, the third worst out of 40 qualifying quarterbacks. Green Bay will now rely on Kizer, who has struggled with accuracy this preseason. He ranks last out of 77 quarterbacks with an adjusted completion percentage of 57.1 percent. Last season as a starter for the Cleveland Browns, he was the league’s worst quarterback in the red zone in every major category. The Packers are also reportedly high on Boyle, an undrafted rookie free agent out of FCS Eastern Kentucky. His preseason performances have been more encouraging, albeit in a much more limited sample size. In two games so far, he’s handled pressure well with the fifth-best passer rating (129.5) on eight dropbacks under pressure. No quarterback has run play action on a higher percentage of their passing plays than Boyle, who has found success with over 13 yards per pass attempt. Over in Seattle, the rookie McGough should make for a strong practice squad candidate. The quick passing game has been particularly effective for him, as his 121.0 passer rating on throws coming out in 2.5 seconds or less is fourth best this preseason. Both teams can now feel a little more sure about who they have working behind their star quarterbacks.